We often think about what our legacy will be—what we will have accomplished and how we will be remembered. For many women, the idea of “making a difference” is vitally important—we hope that our life’s work will make the world a better place for those that follow us. For Mary Lou Lamb, a long-time community volunteer, the need to “give back” and make a difference is central to her life. Consequently, when she was planning her will, it was natural for her to consider planned giving as a way to support her life-long passion for education — and The Women’s Fund was a natural fit for her generosity. From her early career as a Spanish teacher through her current work with school and church outreach groups Mrs. Lamb has always supported women’s and girls’ education and advancement. As a young woman, Mrs. Lamb earned two master’s degrees and completed the studies for a doctorate in education. This led to a 33 year career as a teacher and guidance counselor, a career she still pursues as a mentor for a Troy High School student through Capital Region’s Sponsor-A-Scholar program. She also spent those years as an unofficial partner with her veterinarian husband, Dr. Robert Lamb, whose practice was located in their home. She assisted with surgeries, cleaned cages, and opened their home to animals in need of temporary shelter. Now a widow and in retirement, Mrs. Lamb uses her bilingual skills with Apostalo Hispano, an outreach group through her church in Crescent. 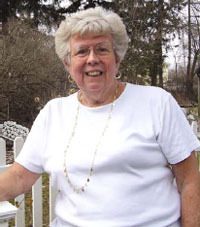 As a volunteer, Mrs. Lamb’s priority was to those who needed financial support and shelter. For more than 18 years, she has helped prepare meals for guests of Bethany House, a day shelter for the homeless in Troy. Currently the president of the board, Mrs. Lamb now guides a group of 5-7 women who have economic and physical challenges. Besides providing the basics of food and clothing, Mrs. Lamb is teaching one young woman to read while helping another earn her GED at Hudson Valley Community College. “Education is the only legal way out of poverty,” Mrs. Lamb believes. So, when her lawyer, James Prout, suggested including The Women’s Fund in her will, Mrs. Lamb immediately agreed. She knew of The Women’s Fund’s mission of economic stability for women and girls, and also knew that the grants awarded would support education through local programs. This mission fit with her lifelong passion for offering young women the tools they need to work their way out of poverty.